Windows Phone 7 adds another to its ranks with its first CDMA offering, the HTC Arrive on Sprint. The Arrive (Price TBA with a new two-year contract) is not the best looking phone out there, but its dazzling screen will draw quite a few eyes. When I first saw the Arrive, it immediately reminded me of HTC's other offering on Sprint, the HTC EVO Shift 4G. Both phones sport 3.6-inch capacitive displays and are roughly the same dimensions (4.63-by-2.32 -by-0.61 inches). The Arrive, however, is slightly heavier at 6.49 ounces. The Arrive feels a little chunky in your hand and you will definitely feel it in your pocket while walking around. That is because, like the Shift, the Arrive features a slide-out full-QWERTY keyboard for when you don't want to touch type on the screen. The keyboard was easy enough to type on, but I wish that certain keys (like the spacebar) were a tad bigger. When you slide the keyboard out, a small spring pops your screen up for a better angle. While this is a nice touch, I found the spring to be a little on the flimsy side. To close the keyboard, you have to press down on the screen then slide it back. The entire process is awkward and definitely takes some getting used to. The phone has a very streamlined design. The power button up top is flush with the rest of the phone and the rounded corners help it sit nicely in your hand during a call. The front of the Arrive has the standard Back, Menu, and Search buttons found on all Windows Phone 7 phones while the back sports a 5-megapixel camera with flash (more on that later). The HTC Arrive is running Windows Phone 7; Microsoft's phone OS they built from scratch. The phone interface looks nice, but requires a fair amount of scrolling to get around. If you do a lot of business on the road, WP7 has an Office Hub containing mobile versions of Excel, PowerPoint, Word, and OneNote. For more on Windows Phone 7, check out our full hands-on here. Windows Phone 7 may also appeal to Xbox Live gamers who want to increase their Gamerscore. You can sign in with your Windows Live ID and import your Xbox 360 avatar onto your phone. Any achievements you earn for the games you play on your phone will also be reflected on your Xbox 360 console and your Games For Windows Live account as well. The Arrive comes pre-loaded with the latest Windows Phone 7 software update (which will be available to GSM phones a little later this year). This update allows you to better search through the Marketplace and launch applications a lot more quickly. The update also brings the much awaited Copy and Paste function that is found on BlackBerry OS, iOS, Android. Highlighting words or sentences in order to copy them proved to be a nightmare. Highlighting was a jerky process where I would try to select a few words and the phone would end up copying the entire paragraph. Both HTC and Sprint preloaded their own hubs onto the phone as well. The Sprint Hub has a few ads for Sprint services, lets you pay your bill, and gives you a list of Sprint sponsored apps that you can download. The HTC Hub just gives you a list of recommended games and apps that you can download (like the HTC YouTube app). The two Hubs aren't very obtrusive, but can be disheartening if you were expecting a pure Windows Phone 7 experience. Another pre-installed app is TeleNav GPS Navigator, though I did not get a chance to play around with it too much. The Arrive's eye-catching 3.6-inch capacitive display is extremely responsive and didn't lag while I flicked and swiped my way through menus. Inside the Arrive is a 1GHz Snapdragon processor similar to what is in the EVO Shift, giving you a very smooth and speedy experience. Pages and apps loaded quickly on Sprint's 3G network, with Web pages displaying the full desktop version of Websites. I downloaded a trial of the game Zombie Attack 2 and had it downloaded and installed in under 2 minutes. Unfortunately, the HTC Arrive does not support Sprint's 4G network-just something to think about before purchasing this phone and signing a contract. Call quality is average. While everything sounded clear on my end, the people I called reported some minor hissing and static on their side of the call. Two people told me that I almost sounded like I was talking into a tin can. The 5-megapixel camera on the Arrive did a pretty good job with still life shots. Colors looked balanced and pictures taken with flash came out looking fine, even when taken in extremely low light. Pictures with moving subjects did not turn out as well. The camera seemed to have trouble focusing when anything in the frame moved. The same thing happened during video recording: sounds were picked up just fine, but moving the camera even the slightest caused the entire picture to become blurry. The HTC Arrive is the first Windows Phone 7 phone for Sprint, but it doesn't offer anything new that we haven't already seen in other WP7 phones other than the fact that it is a CDMA phone. If you are on Sprint and have been desperate to try out a new smartphone OS, the Arrive is worth checking out. For others, it may be worth waiting to see what other WP7 phones are coming down the pipeline or choosing one of Sprint's many Android offerings, like the almost identical HTC EVO Shift 4G. 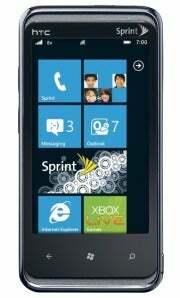 A decent Windows Phone 7 offering for Sprint customers, but its 4G Android counterpart might be more enticing.